Diesel, SP98, SP95-E10, GPLc ... Starting on the October 12, 2018, the name of the fuels at the service stations will change, across the European Union and seven neighboring countries (Iceland, Liechtenstein, Macedonia, Norway, Serbia, Switzerland and Turkey). super ethanol is shown asE85. 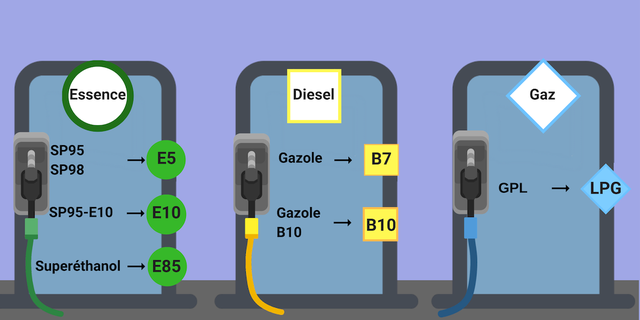 Diesel fuel containing up to 10% biofuels will be called B10. LPG (liquefied petroleum gas fuel), LPG. the compatibility of this fuel with the vehicles.